Gus is unimpressed when Ryan coolly stops his sleek five-speed bike with the hand brake. But he's totally nonplussed when Daddy buys him a bicycle like Ryan's. Gus will never give up his training wheels. Enter Grandpa, who wisely removes Gus from the neighborhood and curious eyes for practice, digs out Daddy's old bike for the occasion, and patiently holds that bike as Gus rides it around and around. Gus's ultimate triumph belongs to Grandpa as well, and will be shared enthusiastically by reluctant riders and their supportive families. 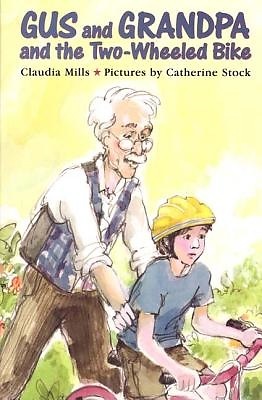 In Gus and Grandpa and the Two-Wheeled Bike, Claudia Mills and Catherine Stock contribute a gem to the bike-riding genre.